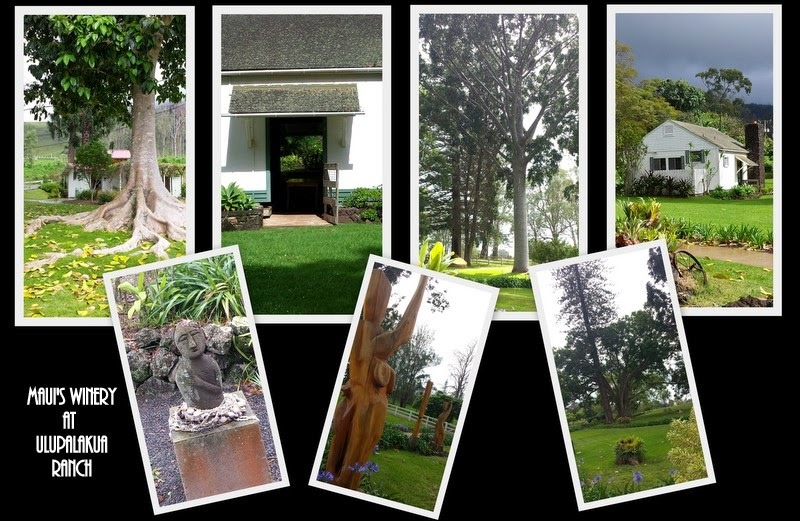 On our most recent upcountry adventure, we added Maui's Winery at Ulupalakua Ranch to our itinerary. Having learned the hard way, the first time that we tried to go to the winery back in January, that GPS will send you astray, we followed the directions on their website this time. After having lunch at Grandma's coffee shop in Kula (definitely worth a stop for a baked treat or lunch), we continued onward. The drive is gorgeous - windy roads through the countryside with views of the ocean. If you're driving, it is your responsibility to keep your eyes on the road. Wine tastings are complimentary. Where else can you try pineapple wine? In addition to the wines, they sell a variety of locally made products and wine accessories. I bought some macadamia sugar for my coffee and some amazing Thai basil sea salt. There's also fascinating information about the history of the land - very different plants and trees grow upcountry compared to the shore. Maui's Winery also has tours at 10:30 and 1:30 and I do love my tours. I'll have to go back for a tour. And another tasting. When you go upcountry, consider visiting Surfing Goat Dairy and/or Kula Country Farms.